Thursday night passed with nary a whimper on the Kawhi Leonard rumor front. Instead the Spurs stood pat and let one of their draft targets fall to them at 18. The 2018 NBA Draft has come and gone, and Spurs star Kawhi Leonard remains, at least for the time being, Spurs’ star Kawhi Leonard. At the team’s practice facility, R.C. Buford addressed members of the media as the night drew to a close. After discussing at great length what the organization saw in the two players that had just been selected, the conversation ultimately, inevitably, turned to back to the Kawhi situation. Where did things stand with the allegedly disgruntled star? Was there a timeline for when the team would like the situation to be resolved? The response sent a nervous ripple of laughter through a crowd that had at least some idea of the missteps — admittedly on both sides, as Buford noted — that had brought player and team to where they were. The Spurs did not move Kawhi Leonard on Thursday, as some predicted they might. There was barely a peep on rumored trade offers — only a tweet earlier in the day from ESPN’s Ramona Shelburne noting that San Antonio had “shut the door” on the Lakers’ attempts of negotiation. In addressing the media, Buford confirmed that the goal remained “to keep him as part of our program for a long time.” The saga, as it seems, may be far from over. While the storm around Kawhi remained in a holding pattern, draft night allowed the organization to move forward in other ways. The Spurs didn’t expect Miami guard Lonnie Walker IV to fall to them at 18 (and had reportedly considered moving up to 11 in order to get him), and his addition means an injection of athleticism, shot creation, and two-way potential on the perimeter, all factors that are welcome for a team with or without Kawhi Leonard. They then nabbed raw USC big man Chimezie Metu with the 49th pick, mildly validating my West Coast Theory while taking a flyer on a guy with potential upside down the road. 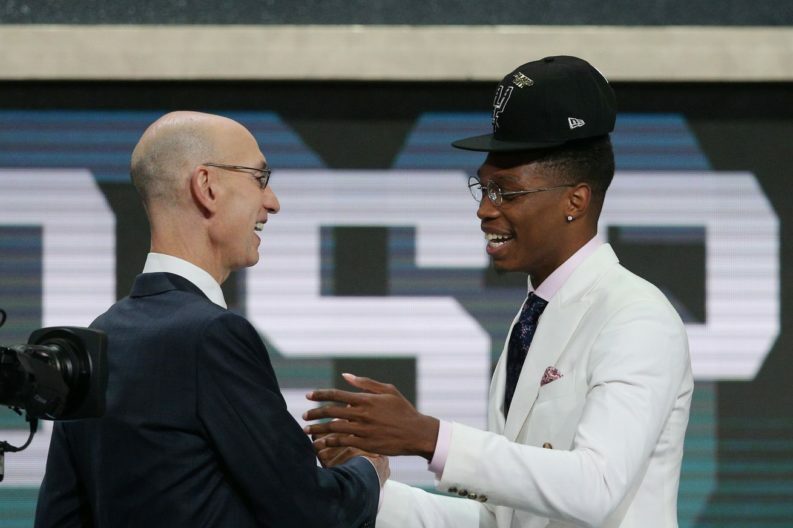 The irony in Walker talking about fit, of course, begins with the visual of the 6’4’’ guard taking the stage, his draft cap humorously, hopelessly propped atop his vertigo-inducing hairdo. “I know the team is gonna get on me about [my hair],” Walker joked over the call. Like his interests off the floor, Walker’s passion for the game and goals as an NBA player also know no bounds. He’s quick to express a desire for greatness — “I’m addicted to being the best. I’m obsessed with being the next great,” he said after being drafted — but not without also stressing his willingness to work hard, learn, and contribute to the team however he’s asked. On Thursday, Buford raved about Walker, not only in what the team saw in him as a player — “This is really an exciting day for us. Lonnie Walker is one of the best athletes in our draft. We had him ranked significantly higher.” — but what he brings as a person. The intangibles, as you’re likely aware, carry great weight to the Spurs organization, and that was clear in Buford’s praise of Walker. He noted a letter the then-college-freshman wrote to his hometown high school (which you can read here), the leadership responsibilities he took on in his sole season at Miami, and how he might fit alongside other young guys like Murray, Derrick White and Kyle Anderson. By selecting Walker, the Spurs added a guy they wanted. By not moving Leonard, they held onto The Guy for at least a while longer. The team’s future remains nebulous, but fans should be at least a little more optimistic as a pivotal offseason gets underway.